Logocentrism and Deconstruction: What's the Différance? 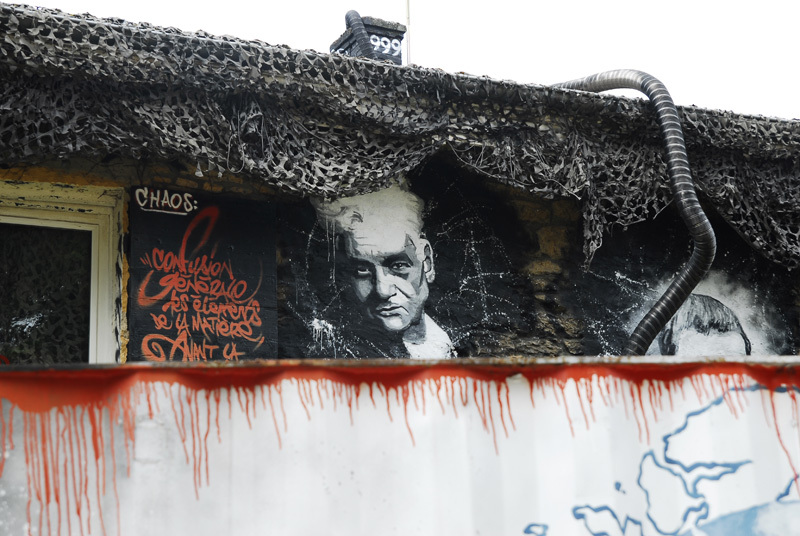 Jacques Derrida, painted portrait. Photo: thierry ehrmann [CC BY 2.0] via Flickr. I have a copy of Jacques Derrida's Writing and Difference sitting on my bookshelf waiting for me to get to it. I also had this introductory text laying around. I am glad I went for the easy option first, as this text saved me from learning the hard way. I am not ready for Derrida - I have to start with Hegel and work my way through to Heidegger first. I am not averse to reading introductory texts, but this one is a little different, in that it is more like a comic book. Or, indeed, it is very similar to the style Alain de Botton has adopted for The School of Life (but this book predates the YouTube series). But the book is not too basic. Even after reading this introductory text, I am little the wiser. I see Derrida's idea of "deconstruction" as an attempt to critique logo-centrism, where Western philosophy tends to privilege one thing over another in a binary either/or paradigm. For example, speech tends to be privileged over writing; philosophy over literature, men over women (traditionally), and so on. To embrace the curious logic of this writing, we have to be willing to sign up to it, to subscribe to it the task it takes on: the creation of destabilizing movements in metaphysical thinking. Had I set out to read Writing and Difference, I would have been lost in Derrida's writing, which this text suggests can be "puzzling, infuriating, and exasperating"(p. 73). It would be better to tackle his three major works on "structuralism and phenomenology" in order: Speech and Phenomena, Writing and Difference, then Of Grammatology. However, the reading list at the end of the text sets out a reading plan to ease into Derrida's work gradually, beginning with Peggy Kamuf's Derrida Reader: Between the Lines. Sound advice. It would seem that I must also go right back to Plato for a closer reading of his work so I can engage with Derrida's Plato's Pharmacy. What all this means is that I am completely out of my depth! Whereas with Albert Camus and even Nietzsche I was able to struggle through, with Derrida I will have to tackle post-modernism (Derrida didn't necessarily think of his work as "post-modern"). I suppose it is time. This text was a good place to start. I also found the School of Life's video (below) useful. I must admit to being pleased to find an area of my knowledge that is so completely lacking as to require considerable thought - especially in approaching Derrida. At the same time, the task is quite daunting and it may have to wait until some time later next year if I am to do it any justice.